The ZIP code system was first introduced because the Postal Service was beginning to be overwhelmed with the volume of mail they needed to process in a timely manner, most of which originally were processed by hand. The ZIP code system made a handy way to increase efficiency in that way. 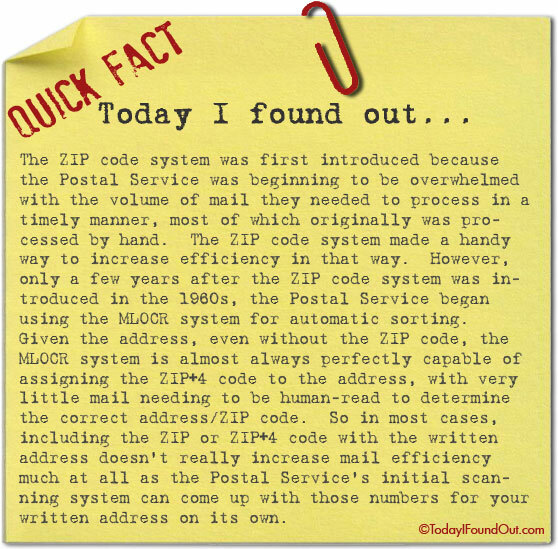 However, only a few years after the ZIP code system was introduced in the 1960s, the Postal Service began using the MLOCR system for automatic sorting. Given the address, even without the ZIP code, the MLOCR system is almost always perfectly capable of assigning the ZIP+4 code to the address, with very little mail needing to be human-read to determine the correct address/ZIP code. So in most cases, including the ZIP or ZIP+4 code with the written address doesn’t really increase mail efficiency much at all as the Postal Service’s initial scanning system can come up with those numbers for your written address on its own. Wrong. ZIP codes are federal districts. By using one you subject yourself to the jurisdiction of the District of Columbia. @Cedrick That’s absurd and meaningless. They relate to postal sorting stations and, in fact, the +4 takes it down to individual P.O. box. Using your erroneous rationale if I used a German postal code I would be subjecting myself to Berlin. In any case it’s no longer necessary to put zip codes on mail as all addresses are read mechanically and assigned the appropriate zip code via OCR. Faster and more error-free. Most importantly (and overlooked), is that a ZIP Code is not required for single-piece price First-Class Mail (including Priority Mail) per Section 602.1.3.e.2 of the 2018 USPS Domestic Mail Manual.